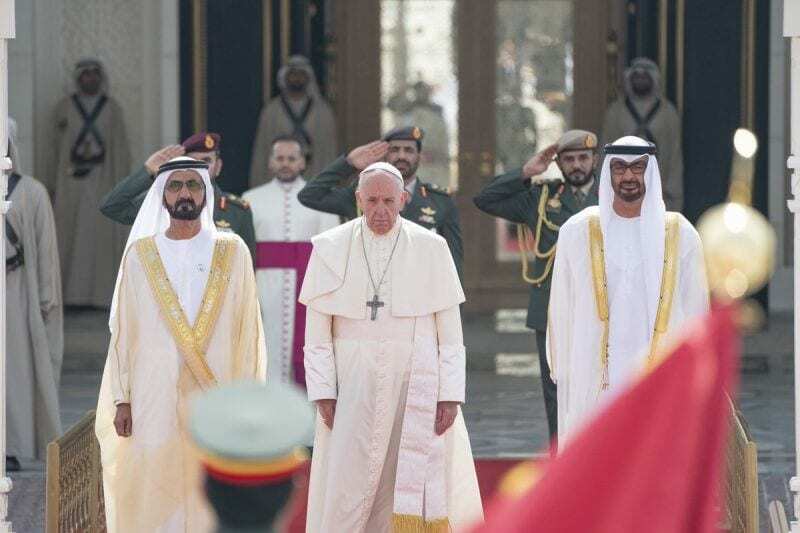 Pope Francis, who arrived in the UAE on Sunday night, met with UAE Vice President and Prime Minister and Ruler of Dubai Sheikh Mohammed bin Rashid Al Maktoum and Abu Dhabi Crown Prince Sheikh Mohamed bin Zayed Al Nahyan at the Presidential Palace in Abu Dhabi on Monday. Pope Francis landed in Abu Dhabi in the United Arab Emirates last Sunday night as the first pontiff to visit the Arabian Peninsula. He departed Tuesday, shortly after celebrating a historic Catholic mass with 135,000 people. The unprecedented nature of this papal visit is awe inspiring. Never in the history of Christianity and Islam has the bishop of Rome travelled to the birthplace of the Muslim faith – let alone celebrated a public mass. Beyond the historic implications, Pope Francis’ visit to the Arabian Peninsula marked a significant step toward advancing the principles of coexistence and religious freedom – a goal he and Sheikh Ahmed el-Tayeb, the grand imam of Egypt’s Al-Azhar Mosque, codified in their joint declaration following the visit. The United States applauds His Highness Sheikh Mohammed bin Zayed Al Nahyan, crown prince of Abu Dhabi, and the UAE government for their invitation. The UAE is host to people from over 200 nationalities who are free to practice their faiths, including Christianity, Islam, Buddhism and Hinduism. Bridging tolerance and understanding with the Muslim world has been a central priority of Pope Francis’s pontificate. He has on five occasions met with Sheikh Ahmed el-Tayeb and visited sacred Islamic sites such as Al-Aqsa Mosque in Israel and the Blue Mosque in Turkey. The pope’s trip to the UAE built off the well-received visit to Saudi Arabia by the late Cardinal Jean-Louis Tauran in 2018, who headed the Vatican’s Pontifical Council for Interreligious Dialogue. The power of this sentiment – that through tolerance and understanding the great religions of the world can find common humanity – cannot be understated. These values of religious diversity and dialogue are also unequivocally shared by the United States under President Trump’s leadership. On his first presidential trip overseas in 2017, President Trump visited religious centers of each Abrahamic faith – Saudi Arabia, Israel and Vatican City. The United States understands that through interfaith engagement and dialogue, as well as respect for religious freedom, countries and regions once beset by division and violence can become more peaceful, secure and prosperous. We congratulate His Holiness Pope Francis on his historic visit to the Arabian Peninsula and look forward to continuing our important work together to advance religious freedom around the world.